Saloustros, S. [et al.]. 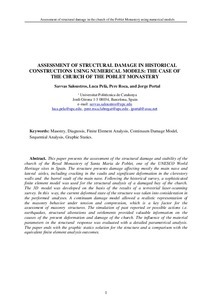 Assessment of structural damage in historical constructions using numerical models : the case of the church of the Poblet Monastery. A: International Conference on Structural Analysis of Historical Construction. "SAHC2014 – 9th International Conference on Structural Analysis of Historical Constructions". Mexico City: 2014, p. 1-12.